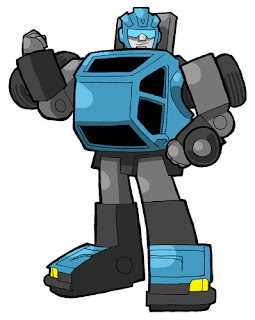 After posting Bumblebee and Cliffjumper yesterday, I got thinking about the "secret" third little car brother. In Japan, these three toys shipped in three different colors: Red, Yellow, and Blue. 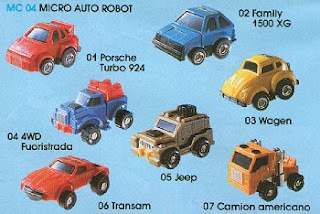 Bumblebee was a Volkswagon, Cliffjumper a Porsche, and the third a Mazda Familia. I've honored the third color option of blue, which was also how he appeared in the MicroChange toy pamphlets!